You can make your own personalized free wine labels in just a few minutes of time using one of these free templates. With the templates, you can create wine labels that say whatever you want, including names, dates, and special messages. These free wine labels can be used to create personalized wine bottles for weddings, parties, holiday gatherings, or to give as gifts. If you're a winemaker, then you'll love being able to create custom wine labels for the very wine that you made. There are a few different ways to attach these free wine labels to your bottle of wines. Print out the wine labels on label paper or on regular paper and using double stick tape or a glue stick to adhere them to the bottle. Tip: Make sure the bottle is clean and dry before attaching the wine labels. It will make sure that the labels will stick on the bottle for years to come. There are more free labels available for water bottles, envelopes, and canning jars as well as vintage labels. The Fresh Exchange has designed three unique wine labels that are completely free for you to download and use any time of year. The three labels say "Good Food, Good Times, Good Laughs," "Give Thanks," and "Celebrate." They used these Avery rectangular labels to print them on, but you could certainly use any labels or regular paper you have. Here are 6 free wine label templates for weddings, housewarmings, birthdays, parties, friends, and family dinners. All have very pretty designs in blushes and coppers. These can be downloaded as labels as seen here or tags that you slip over the neck of the wine bottle. There are also instructions included on how to apply the labels after printing. Canva has some wine label templates that you can fully customize with your own text and images. There are over a dozen different designs that would work for bottles you'd like to gift or for labels if you bottle your own wine. Canva makes the process very simple, just make the changes you want and then print your labels. You can change images, text, colors, layout, and more. Here are some free wine bottle labels that would be perfect for a wedding. They're designed in a rustic chalkboard style, meaning that they would go with just about any theme. There are two different labels here - "Cheers To Love, Laughter & Happily Ever After" and "Eat, Drink & Be Married." There's also room for you to put the name of the couple or the wine. These labels are simple, rectangular label, such as Avery 5264. 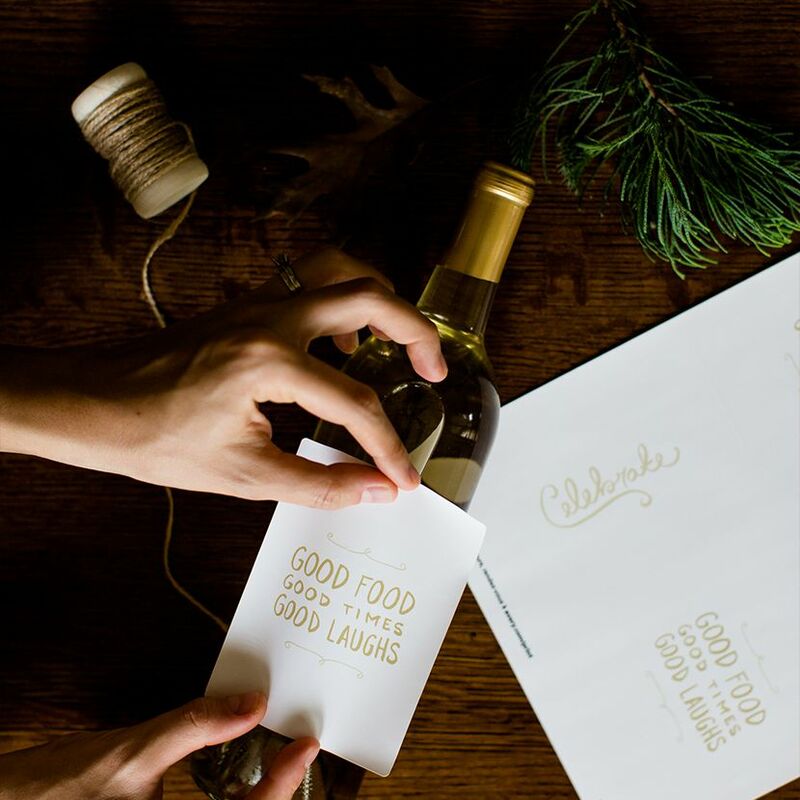 These free holiday wine bottle labels from The Elli Blog, make a quick and thoughtful holiday gift that's sure to please any friend or neighbor. They have a kraft paper look to them with red, white, and green writing in phrases such as "Oh What Fun! ", "Merry Christmas," "Drink & Be Merry! ", and "Holiday Cheer." 8.5x11 sized labels work best for these, such as Avery 5265 labels. This free printable is even easier than wine labels - their wine tags — no need to mess with labels when you can just print these out on cardstock and add them to a wine bottle. These can be used year round, and for just about any occasion, the tags include "Sip, Sip Hooray," "Class Guys Drink Wine," "Thank You! ", and "Cheers to You!" Each wine tag has a place for you to write your name and the lucky receipts' name. These mini wine bottle labels are going to be perfect for a wedding favor. They can be customized with your names, location, and any other text you'd like to include. These free wine labels can also be printed on colored cardstock so you can get the perfect wedding color shade. LoveToKnow has 6 different free wine label designs that can all be customized with the name of your wine, creator, and any other text you'd like to add to the label. These wine label designs include one with grapes, cupids, and other simpler designs. These free holiday wine labels need to be printed out and then adhered to your bottle of wine. They make great gifts but are also just great to sit on the holiday table. There are 12 different holiday wine labels designs here, so you have plenty to choose from. Better Homes & Gardens also has some free fall wine labels that include fall, Thanksgiving, and Halloween designs.